We have progressed with our project to the point that the bulk of the work in Eeschema is complete, and the only thing left to do is to export the netlist file. 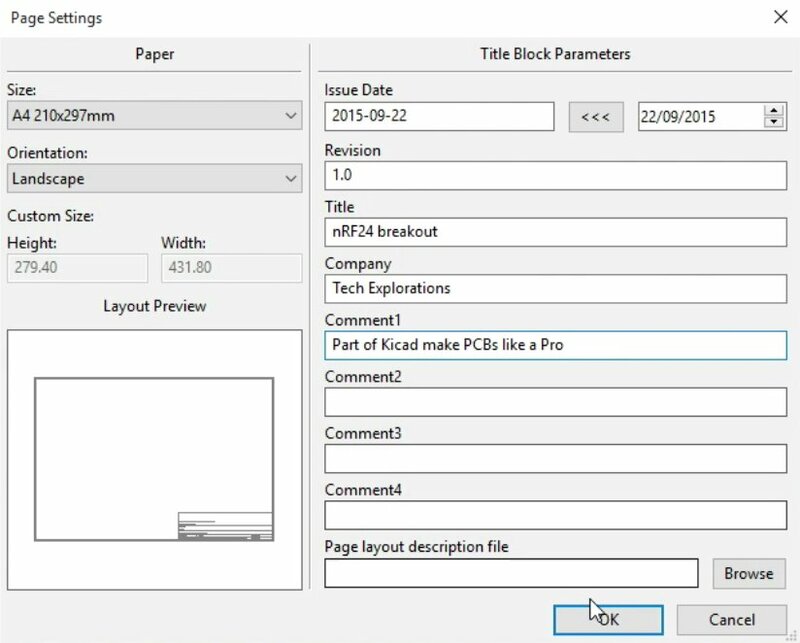 In this chapter I will show you how to export the netlist file from Eeschema, and then import it into Pcbnew. Start Kicad and then launch Eeschema if it’s not already started. This is the current version of the project. The current state of the project. We will export the netlist for this schematic. To export the Netlist file we will click on the Generate Netlist button. This is the Generate Netlist button. The options in the export window are straight forward. We don’t have to worry about OrcadPCB, CadStar or Spice. We are not working with these applications. 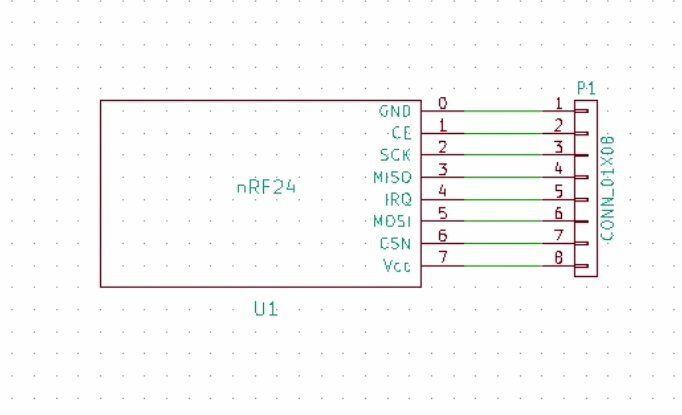 We are staying completely within Kicad. 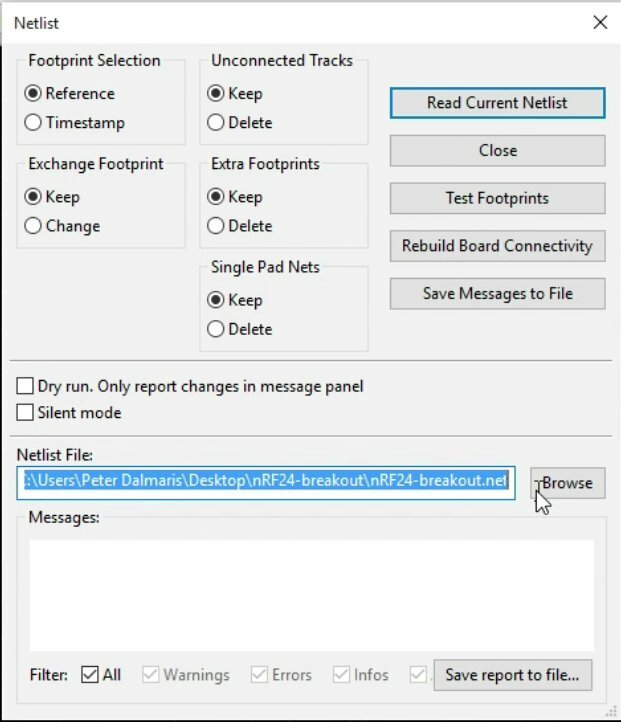 Simply select the Default format option in the Pcbnew tab, and click on Generate to generate the Netlist file. Next, choose the location of the exported file to be somewhere inside the project directory. 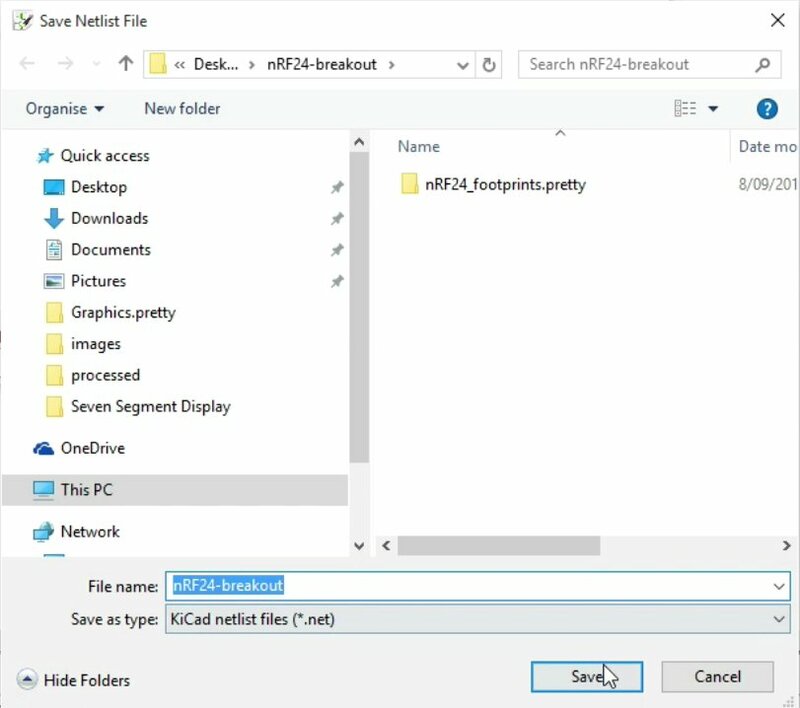 Save the netlist file in the project directory. If you go into you project directory, you will see the new netlist file. 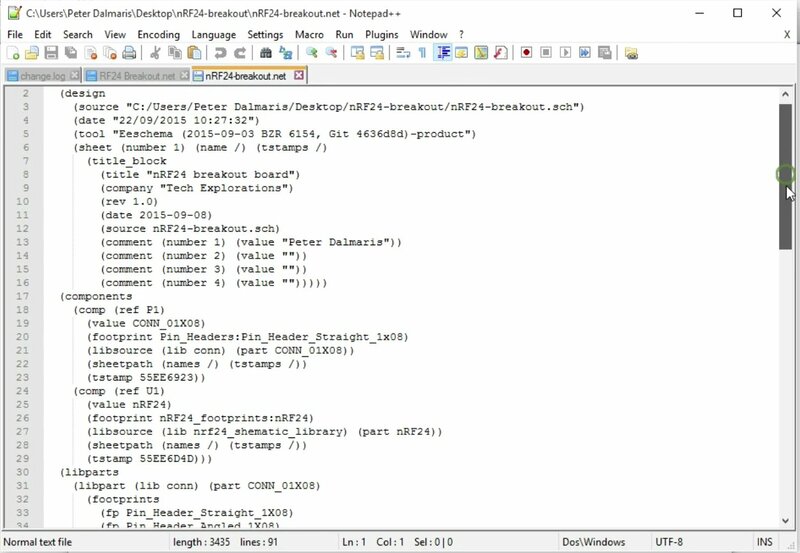 It is a simple text file and you can inspect it with a text editor. Open it with Notepad++ (or any text editor), and notice that this file contains all the information that Pcbnew, the PCB layout program, will need in order to know which components are supposed to be included and what are the connections between those components, information about nets and so on, is all in here. The content of the netlist file is standard text. Close Eeschema and move on to the next step. 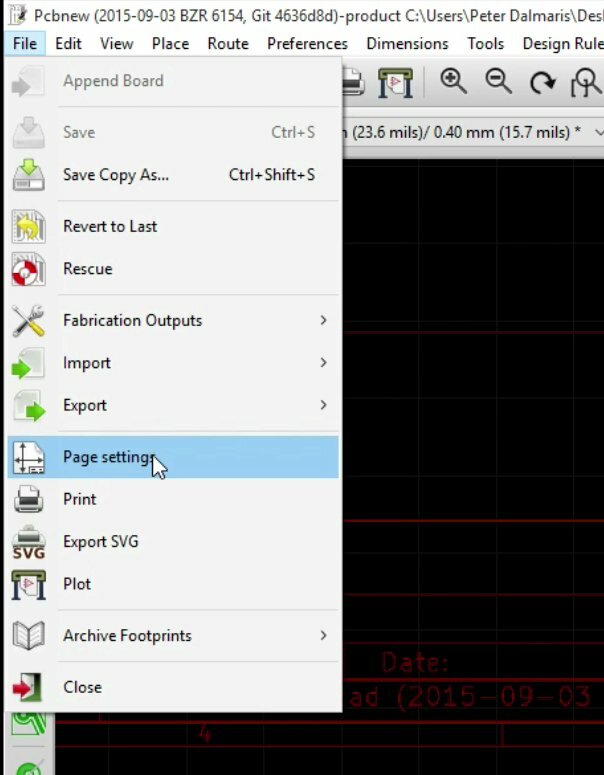 To start the PCB layout editor, Click on Pcbnew. When Pcbnew starts, you will see a blank canvas. It is very similar to the canvas that we use in EEschema. At the bottom right corner of the canvas you can see the the information for the project. Let’s setup the contents of the label in the bottom right corner of the canvas. The project information is in the bottom right corner of the canvas. To set up the contents of the project information box, click on File and then we go to page settings. Edit the contents of the information box by selecting “Page settings” in the File menu. Fill the fields with the information you would like to show in the information box. as many or as little as you like. Enter the information you would like to include in the information box. Click OK when you are finished typing in the information. Notice that the information now appears in the legend of the canvas. The updated information in the Pcbnew legend. Next, let’s read the Netlist file and import all the footprints that make up the project. To read the Netlist file you click on the button marked “NET”. The default settings in the netlist import dialog are good as they are. Browse for the location of the netlist file (although most likely the path to the file will already be in file field). 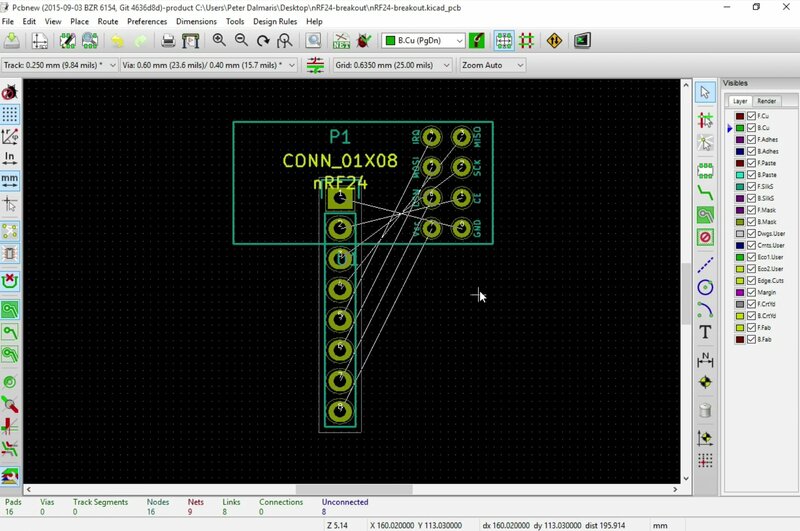 Kicad, through the Netlist, file can track new components and old components. 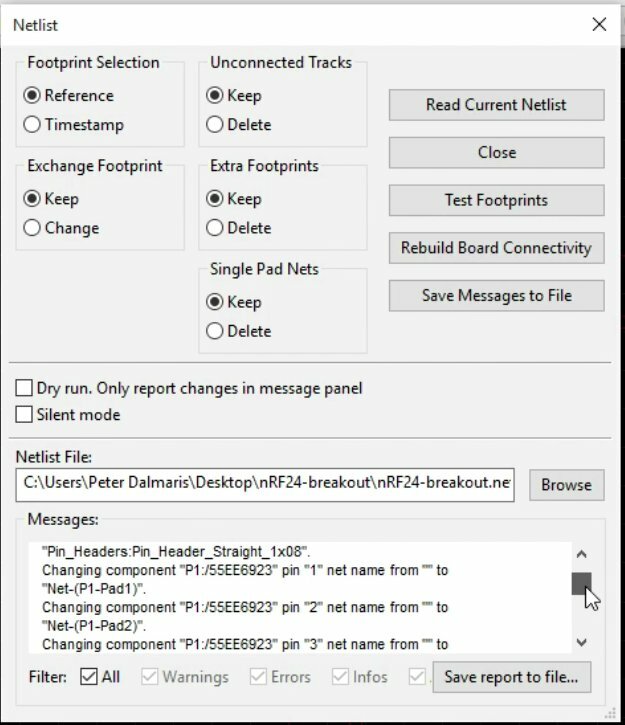 We will see later, for example, that a change that I will introduce to my original schematic will be reflected in Pcbnew via updating the netlist file. 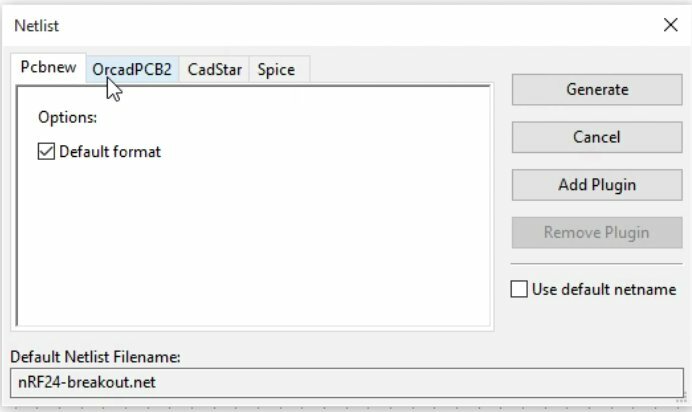 Kicad is able to detect new components in a netlist file and only import the new components from Eeschema into Pcbnew. 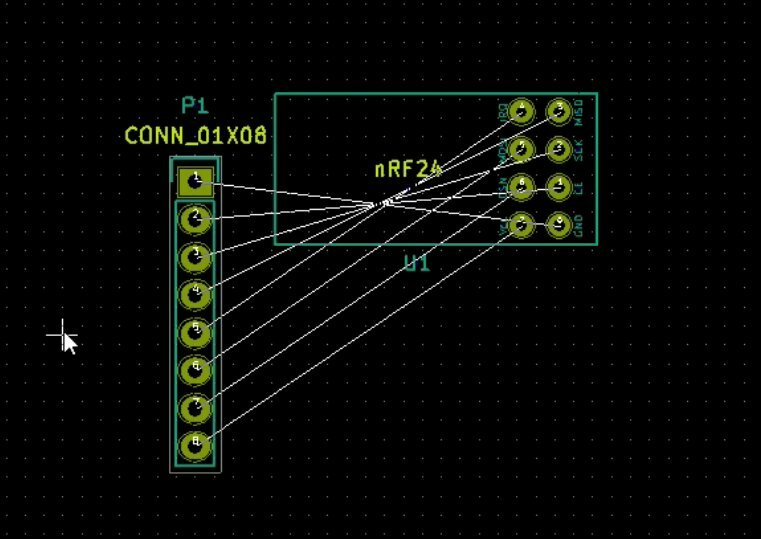 This allows you to make changes to your schematic and then import those changes into your PCB layout without losing any work. I’m going to demonstrate this in practice in one of the upcoming chapters. We not going to change any of the parameters for the import here, so go ahead and click on the Read Current Netlist button. A report of the netlist import is provided in the Messages text box, once the import is complete. At the bottom part of the Netlist window you can see the import report. There are no error messages. Close the window. As the Netlist file was read by the application, it placed all of the components right in the middle of my canvas. The footprints, after the import from the netlist file. Imagine the situation where you had 10 or 20 or 100 components, all of those would appear right one on top of the other. It would be a big hassle to manually move them out. 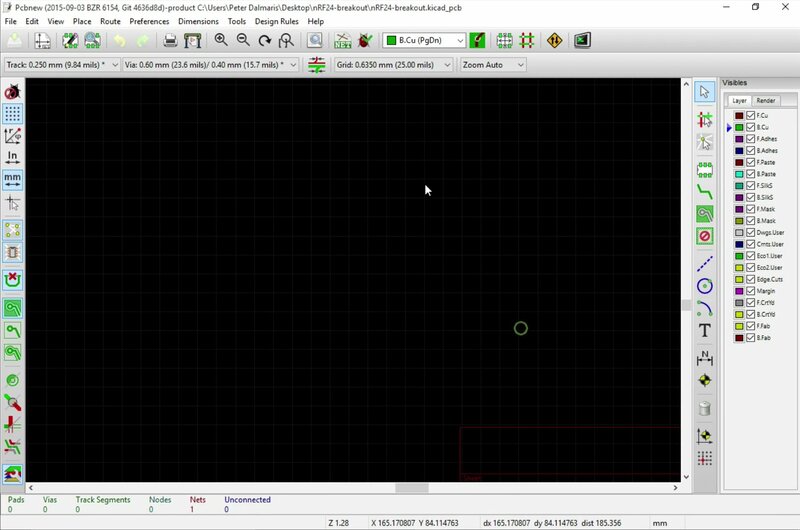 Kicad provides a nice feature to allow you to automatically separate those components before you manually set them and place them where you like them on the PCB. To enable that feature you click on Mode Footprint button. Once you enable Mode Footprint, you can right click anywhere on the bundle and you can see that there is an option called “global spread and place”. Then, select “spread out all footprints”. 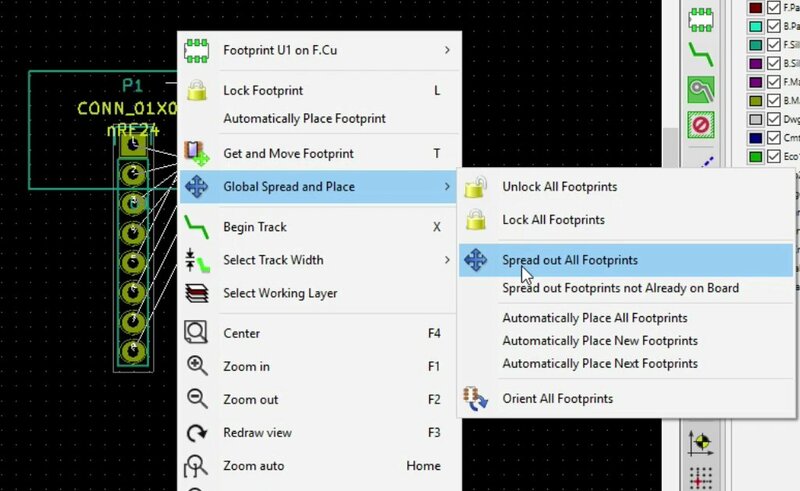 Through the right click menu, you can access the “Spread out all footprints” function. You will get a warning that locked footprints will not be moved. This is ok, as we don’t have any such footprints. Click “Yes,” . The footprints are now spread on the canvas. Now it’s cleaner. If you had 10 or 20 or a lot more components then those components would be nicely spread out the canvas, so you can then start doing your wiring or placement. In the next chapter we will work on the footprint placement.